As Mahanati is getting ready for release, here is a look at the story of Savitri and Gemini Ganesan, one of the most controversial and iconic couples who made their mark off screen and on screen. The first time Gemini Ganesan met Savitri, he was just Ramaswami Ganesan, a casting assistant at the Gemini Studios. It was in fact, his association with Gemini Studios that gave Ganesan his moniker, Gemini Ganesan. During his tenure at the studios in the 1940s, Ganesan interviewed several film aspirants and he met a young woman named Savitri from Andhra Pradesh. According to a report in Hans India, the late actor, appreciative of Savitri’s smile, had filed her photographs with a note that said ‘looks promising if given the opportunity’. Little did anyone know that the couple would become the faces of memorable stories off screen and on-screen. It took sometime before the paths of Savitri and Gemini Ganesan crossed again. Both of them had found their way in front of the camera and had a couple of noteworthy roles in the repertoire. 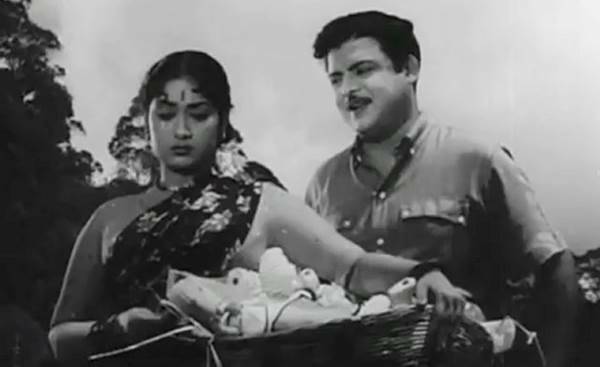 Savitri had garnered eyeballs with her role in Pelli Chesi Choodu and Gemini Ganesan had his antagonist role in Thai Ullam that had fetched him recognition. But Manam Pola Mangalyam proved to be an important film in the careers of both Savitri and Ganesan. Not only was the film a blockbuster hit, the film also proved to be the foundation for the successful partnership the couple would forge in the years to come. It was after this film, Ganesan was rechristened, Gemini Ganesan. The couple were soon drawn to each other and fell in love. They also reportedly got married secretly and kept their relationship under wraps for quite some time. This was due to several reasons — Gemini Ganesan was already married to his first wife Alamelu, a marriage that gave him four children. He also had a dalliance with actor Pushpavalli and fathered Bhanurekha (now popularly known as actor Rekha) and Radha. Thus, Savitri faced severe backlash for marrying Gemini Ganesan who had slowly acquired the title ‘Kadhal Mannan’ (The king of romance). In fact, the relationship came out in the open when Savitri signed an advertisement as Savitri Ganesan. In a The Hindu article, Randor Guy remembers the media having a field day with the piece of information. “Ganesan was already married and had children and not surprisingly the second matrimonial venture was hot news. When Savitri endorsed a branded hair oil ad and signed it as ‘Savitri Ganesh,’ it became ‘news’ of the day!” he wrote. The couple were one of the most sought-after pairs on screen, making iconic films like Missiamma, Pasamalar, Kappalottiya Thamizhan and Kalathur Kannamma (debut of Kamal Haasan) among several others. “Theirs was a sustained union that lasted for more than a dozen years with a marriage, household and children. The Gemini-Savitri relationship worked wonders for their private as well as screen lives.” Savitri earned the moniker Nadigaiyar Thilagam. The couple had two children — a daughter and a son. Several media reports suggest that despite being married, the couple would not stay together. The differences began to crop up later in the day. A well-known philanthropist, Savitri was an actor who never thought twice before spending. Her doors were open and she was known to give away to anybody in need. As a result, her finances weakened pushing her into trouble. She was further set back by a few projects that she directed and produced that failed to work. By this time her relationship with Gemini had also hit a rocky patch. Crushed by her troubles, Savitri finally fell prey to alcoholism. “Amma, however, did not know how to handle her troubles. She wasn’t clever to deal with the situation. She was innocent and it affected her very badly. Also, she never had any proper guidance, that’s why she became an alcoholic. Once she slipped into coma, that lasted 19 months, there was no talking to her. We were certain she will come back, but it was a long wait and it ended only with her death. It was so terrible to watch her on the hospital bed,” narrated her daughter Vijaya Chamundeswari in a Deccan Chronicle article. The film Mahanati (also a title Savitri received in Telugu) will, however, focus on Savitri’s rise to stardom. Starring Keerthy Suresh as the yesteryear leading lady, Dulquer Salmaan will be essaying the role of Gemini Ganesan. Also starring Samantha Akkineni and Vijay Devarkonda, the film is expected to release this May.